New York City, the city that never sleeps is known for a lot of things from high fashion, education, finance, technology, important landmarks, etc., what most people do not know is that NYC also boasts of a wide variety of beaches and gorgeous, secluded botanic gardens where you can relax and immerse yourself in quiet serenity away from the intensity of the city. It's hard to be a tourist in your own town but I really wanted to visit one of New York City's botanical gardens so I went to the Brooklyn Botanic Garden, which is next to the Brooklyn Museum. I loved it so much, I had to go again. The garden was founded in 1910 and contains over 10,000 different types of plants. There is always something to see at the garden regardless of the time of year that you visit. In the winter, there is the dwarf blue spruce outside the Fragrance Garden. Other plants in bloom include the orchids, South African bulbs and witch hazels. 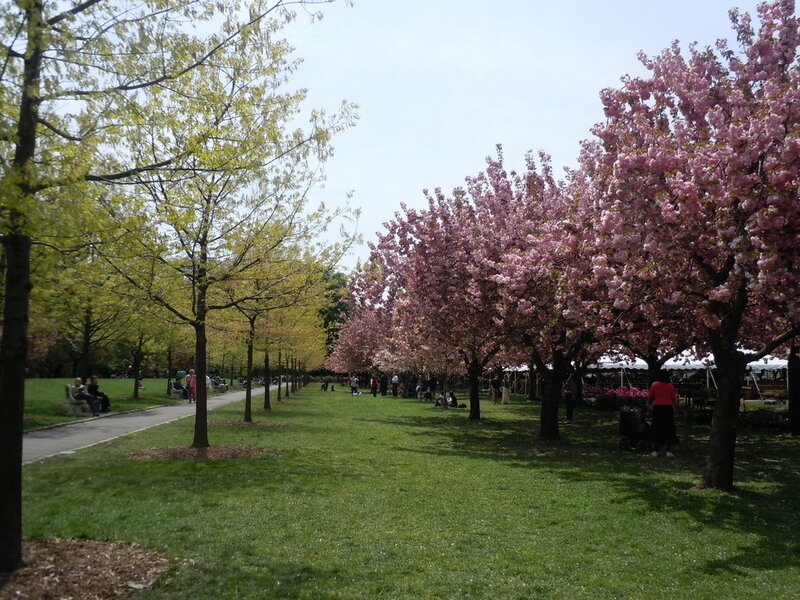 Spring is one of my favorite seasons to visit the garden; they have a variety of flowers in bloom such as cherry trees and magonolias in the Japanese Garden and the Cherry Esplanade. Fragrant lilacs, tulips, and native wildflowers are also in bloom during this time. The summer months boast of tree peonies, rhodendoron bushes and a massive burst of rose flowers, water lilies and strawflowers that bloom all summer long. The garden also has a tropical greenhouse that showcases a wide array of beautiful plants and flowers from around the world. Experience the cherry blossom season by checking out gorgeous pale pink double-flowering cherries that blossom towards the end of April and are a centerpiece of the Garden's annual cherry festival, Sakuri Matchuri. The esplanade is draped with eight kinds of grass, where visitors can sit and picnic during the summer. "This is one of the oldest and most visited Japanese-inspired gardens outside Japan. It is a blend of the ancient hill-and-pond style and the more recent stroll-garden style, in which various landscape features are gradually revealed along winding paths. The garden features artificial hills contoured around a pond, a waterfall, and an island while carefully placed rocks also play a leading role. Among the major architectural elements of the garden are wooden bridges, stone lanterns, a viewing pavilion, the Torii or gateway, and a Shinto shrine" (BBG Website). This holds a large collection of orchids, tropical and subtropical aquatic and wet environment plants from around the world. This showcases plants from arid regions such as Mexico, Peru, Bolivia, Chile, South Africa, Madagascar, etc. There's the Tropical Pavilion—6,000 square feet under glass—soars to a height of 65 feet to accommodate its tallest trees. This part of the garden recreates a tropical forest and represents main tropical regions such as the Amazon basin, African rainforest, and tropical eastern Asia. It also includes mini waterfalls and streams. Contains two large pools of water bordered by the Mixed Perenial and Annual Borders. The pools are encompassed by nearly a 100 varieties of tropical water lilies and sacred lotuses and they are in full bloom during the summer months. The perennial border on the east side of the Lily Pool contains herbaceous plants while the Annual Border boasts of a full display of tulips, alliums and other plants that are in full bloom in spring. Other places to look out for include Alice Recknagel Ireys Fragrance Garden, The Herb Garden, and The Children's Garden. Thank you guys for stopping by; until next time, stay blessed!